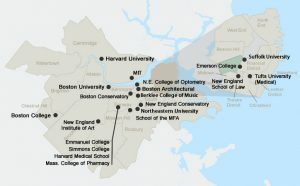 The metropolitan area of Boston is famous for its high concentration of prestigious universities and private colleges. They employ over 70,000 people and attract over 360,000 students annually from all over the world. Here is a list of higher education institutions in Boston. Located in Back Bay neighborhood of Boston, Bay State College is a private college that is focused on business, information technology, and healthcare programs. It offers 15 bachelor’s degree concentrations and programs, eight associate degree programs, seven minors, two graduate program partnerships, and one certificate program. It is a non-profit private college, established in 1908, for engineering and industrial technologies. The entire college is funded by Benjamin Franklin’s will and offers 14 programs of bachelor’s degree, associate degrees, and study awarding certificates. The largest independent college of contemporary music in the world, the college is known for the study of modern American music and jazz. It offers college-level courses for a wide variety of music which includes bluegrass, flamenco, hip hop, reggae, rock, and salsa. The college also has online courses, degree and certificate programs. Boston Architectural College offers professional bachelor’s and master’s degrees in architecture, landscape architecture, interior architecture, and non-professional design studies. A former performing arts conservatory, it offers Master of Music, Master of Fine Arts, Bachelor of Music, Bachelor of Fine Arts, Artist Diplomas, Professional Studies Certificates and Graduate Performance Diplomas. A private research university, Boston University offers bachelor’s, master’s, dental, law, business and doctorate degrees through its 17 colleges and schools on two campuses. Located in downtown Boston, Emerson College offers more than three dozen degree programs in Arts and Communication. A private coeducational Roman Catholic liberal arts college, it provides over 50 minors, majors, and concentrations. It also offers graduate and professional programs for nursing and management. A non-profit, private and independent institution, it offers Baccalaureate and Associate degrees, Masters of Business Administration and a concentration in Strategic Leadership. Established in 1636, it is a private Ivy league research university. Its history, wealth, and influence make it a prestigious university. Also known as MassArt, it is the only visual and applied art school in the United States that is publicly funded and free-standing. It was also the first school to give an artistic degree. Also known as MCPHS, it offers pharmacy and health science courses through accelerated and traditional programs of study. A private research and prestigious university, MIT offers various graduate, undergraduate and doctoral degrees in different fields. Formerly known as Massachusetts School of Professional Psychology, it provides graduate certificates in clinical, counseling, organizational and leadership psychology. A graduate university of health sciences, it offers courses in physical therapy, communication sciences and disorders, health professions education, physician assistant studies, nursing, and occupational therapy. A private for-profit online college, it grants undergraduate, graduate, and associate’s degrees in international business, digital marketing, and business. The second oldest optometry operation college in the United States offers Doctor of Optometry and Master of Science degrees in vision science. The oldest independent school of music in America, it grants degrees in Bachelor of Music, Master of Music, and Doctor of Musical Arts. Also known as NESL, the college specializes in international law, environmental law and tax law. An arts-based school, it offers its students a two-year Professional Photography Program. Popularly known as NU, it is a private research university which provides both undergraduate and graduate degree programs. A catholic major seminary, the college has programs for lay students and seminary programs. It is a school that is dedicated to offering graduate and undergraduate degrees in visual arts. 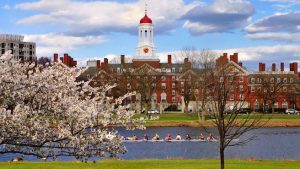 Set up in 1899, it is a private co-educational graduate school and women focused undergraduate school in Boston. The college provides degrees in liberal arts, public policy, gender and cultural studies, communications management, and education. A non-sectarian and private university, the college provides graduate and undergraduate degrees in arts and sciences, law, and business. A public research university, the college gives bachelor’s, master’s, and doctoral degrees finance, accounting, biochemistry, information technology, computer science, economics, criminal justice and more. A co-educational, independent, engineering and technical design college provide 17 bachelor’s degree programs in architecture, computer science, interior design, engineering technology, management, architecture and applied mathematics. They also give master’s degrees in civil engineering, construction management, technology management, facility management, and architecture. Established in 1888, the college gives graduate and undergraduate degrees in family studies, social work, education and child life, and Arts and sciences.